I'm usually a "one holiday at a time" kind of person. Seeing Christmas ads on tv and the store shelves packed with Christmas goodies before Halloween makes me cringe. This year, I'm finding it harder to resist decking the halls! 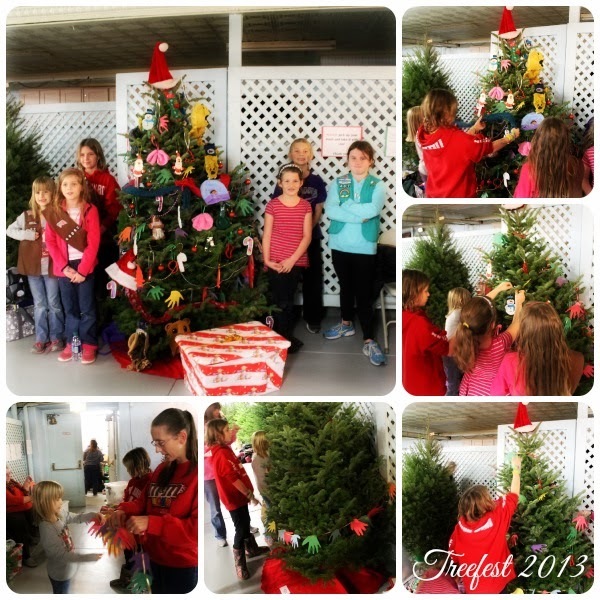 Yesterday, I was able to get a little fix by getting together with Madelyn's Brownie troop to decorate a tree for Treefest. Their theme was helping hands. Treefest is a fundraiser for the Bloomsburg Theatre Ensemble where trees are donated and decorated by various groups and organizations. We're talking over a hundred trees! At the conclusion of the event, all the trees and the gifts under them are donated to local families in need. Hopefully next weekend we will be able to return to see all of the completed trees and enjoy the festivities. It really is amazing to see all the different themes and decorations. Just beautiful! In Europe, they don't celebrate Halloween (some, but not much) or Thanksgiving, so you will see Christmas lights up "early". They only use clear lights for the most part though, so it's really pretty at night. We're right into the Market season and it's so much fun discovering new cities, with their holiday finest on display. Looks like your girls are having A LOT of fun!! !